Today I had to go to the post office on the way to work, so here I am at the office with my KTS package! It was from generous Emy in Singapore! The inventory includes three balls of hemp/cotton yarn ( you can tell this is from another country), eight kinds of tea: lychee/lime/passionfruit, lemongrass/ginger, and a sampler of Chinese teas in little canisters, plus cookies and chocolate bars! The cookies were cleverly hidden in the center of the yarn balls. This was just delightful. Thanks, Emy. It was wonderful to get so many treats that I normally would not have access to. 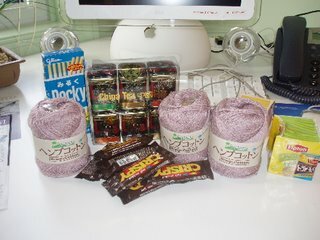 The yarn I will take home, but the treats are staying here so I won’t have to share! So glad u liked them all. And spotted those cookies in the yarn centers!